Soooooo, after a whole bunch of build-up for our first winter storm and frantically replacing the tarp on our hay shelter and getting a load of firewood dropped off and moving *some* things into safer and drier spots (the kids did it in kid fashion), we had a whole bunch of wind and black clouds blew in and…we woke up to clear and sunny skies. The kids have been merrily burning our wood, though, keeping the living room in the mid-seventies. Time to turn on the evaporative cooler. It is cloudy and cooler today and in the mid-50s, but still no rain. We are really hoping to fill up our nearly-dry pond over the winter, though, as the goat shelter still only has a small section (about 4×8) roofed, I’m not looking forward to dealing with their wintertime mud-and-manure floor, or soggy, rotting hay in their feeder. In time, in time….and we’ll be so glad and grateful when we finally get everything built up the way we’d like to! We ran out of both chicken feed and goat grains just in time for my husband to get sick. The chickens went hungry and ate their own eggs (didn’t find out about that until after the fact) and I got online to find recipes for homemade chow for lactating goats. I wanted sufficient protein in my mix, but was really nervous about rapidly introducing new foods into their diet and messing up their rumens, so I decided to keep it to just two ingredients, barley and sunflower seeds. I soaked the barley overnight in water with a splash of apple cider vinegar to improve its digestibility and then when I got ready to milk, I mixed in a little bit of sucanat since they were used to a sweet feed with molasses. Well, Penelope hopped up on the stand and got a mouthful before she knew what was going on, winced and snorted a bit, but ended up eating it all down. Angel, on the other hand, smelled something weird as she was coming into the garage/milking parlor and needed a bit of coaxing to even get up on the stand. She pushed her head into the stanchion while Penny’s mostly empty bucket (I put their grains over a bucket full of chopped hay) was still in place, I replaced it with her full bucket and she literally turned up her nose and wouldn’t touch it, despite my coaxing and cajoling. After a few minutes, I scooped off as much of the grain as I could, rubbed her chest, hobbled her back legs and she decided to eat and let me milk her despite the fact that I was obviously trying to kill her. All right, that’s the story of Sunday’s milking. Now, to dry up a goat, one of the things you do is to start withholding grain, so I had certain expectations heading into Monday’s milking. Monday evening we had their normal feed again, and I was generous in their helpings because I really like having milk…I’m really sad about having to dry them up this month… Anyhow, Penelope, who ate the grain was down nearly a full cup (to 3 1/4 cups), and Angel, who did not eat the grain, was up to a full pint again! I have no idea what to expect tonight. I am working on a family history-related Christmas present for my kids and spent most of Sunday going through my grandfather’s last four years of letters, copying and pasting family stories into a word processing file so they will have copies of these. I’m so grateful that he was a letter-writer and that he recorded all he did. Letter-writing and journal-keeping are things that I was really good about in my younger years and really terrible at since marrying and having children. I am hoping to do better. This blog is part of that effort! 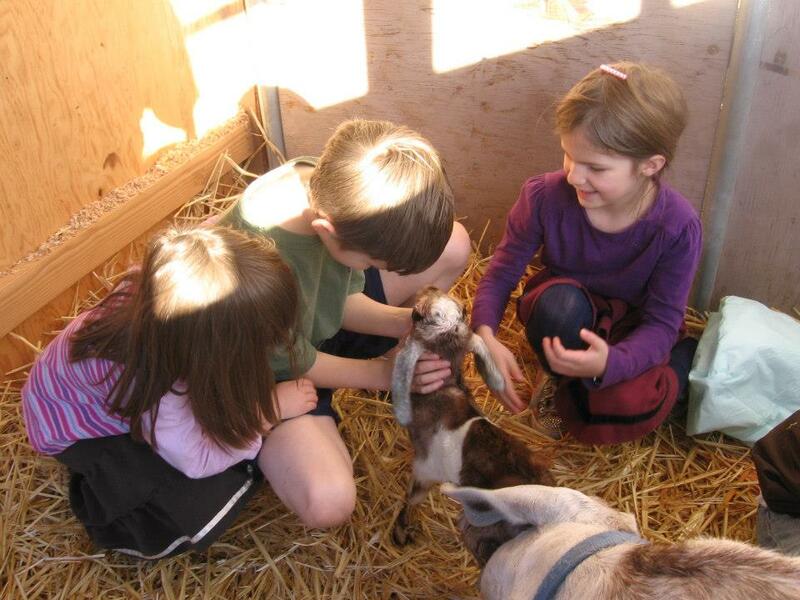 Tags: goats, records, the barnyard, the family | Permalink. I think I will record this here for the next few weeks until we dry up our goats. Tonight Angel was a little under a pint and Penelope a little under a quart. They are doing this just to make sure I am not sad about having to dry them up. When I was four and five, my dad attended graduate school in Chicago. We lived in a little 2 bed/1 bath high-rise apartment building. If I peered out the window of my parents’ bedroom I could look down on the playground lot. They had great (and deadly) teeter-totters and, I believe, a merry-go-round, swings and a lot of concrete. There may have been grass, but it left no impression on me. That may have been because my dad took a summer internship and temporarily moved us to a little, teeny town in upstate New York for the months that would have had some green about. Our rental house was on a typical suburban-size lot. It was a wonderful break from the big city and when the company offered my dad a permanent position after graduation, he accepted. When we arrived at that second house, it was late. The house impressed me as being rather large, but as the goal was bed ASAP, I only remember not being able to see anything in the pitch black outside the windows (that was different from the city) and being rapidly bedded down. The next morning was like Christmas morning. I remember, first, running from room to room to room to room and then looking out the windows. Looking at the info on the house (the wonders of the internet), I can see that the lot was not even a full acre, but it looked endless to my little city-cramped eyes. Besides GRASS there was a tennis court surrounded by apple trees and with concord grapes growing at one end and (I will always think of the family that owned the house with immense gratitude for this) there was a large garden plot already planted and growing! My little sister was born in Chicago and my mother had never been able to get her to eat vegetables, but Chicago vegetables had little in common with what was growing there. She used to sit between the rows of peas and eat them right off the plant. I remember eating corn on the cob fresh from that garden, knocking Japanese beetles off the grape vines and the subsequent juicing of the harvest (concord grapes are STILL one of my favorite smells), picking and eating apples, then the apple blossoms and replanting the garden the following Spring, and of course Big Wheel bikes on the tennis court and lots and lots and lots of running and playing in that great, “endless” yard. We lived there for three years. I spent the second half of my Junior year of college in London. At our orientation, one of the professors encouraged us not to be “prairie dogs”, popping down into the Tube (subway) at one location and only popping up when we got to our destination. He said we couldn’t really get to know the city unless we walked it. I took his advice. Actually, I really didn’t have much of a choice (I could either go to museums and plays OR ride the Tube, but not both)…but I would think of his advice when it took me an hour of walking to meet up with the rest of the class for a field trip, or Church, or wherever else I needed and wanted to go. I was ALWAYS out and walking around, which made it so odd when I attended a Church conference out in the London suburbs and came up out of the Tube station (I had to that time as it would have been about five hours round trip) and found myself standing in open space. I literally gasped. To NOT be completely hemmed in by buildings! My husband accepted a job in California while he was finishing up his schooling and we went out for a house-hunting trip late that Fall. Before we got out there we had set our price range and were pretty confident we’d be able to find something great. The reality did not match our expectations. The houses we looked at were falling down, in crime-ridden areas, enormous distances from work. We re-crunched the numbers and determined we could inch up a little in price if we just lived poor for a while and went out for a final pass. Still, there were so many problems with them all and the daylight was fading on the last day of our trip. We decided to go to one that we’d decided against seeing before. It was a little starter home built back in the 50’s, single pane windows, no insulation, no central anything. The single-car garage had been converted into a room, but then had flooded due to faulty grading and had all the flooring torn out. The kitchen had about two linear feet of counter space, no dishwasher and very few cabinets, but as I stood there and looked around, I could see our kids running through it. My husband was shocked when I said I thought this might be it. He walked it again and then we went outside and looked at the yard. It was on half an acre of nearly flat land cut stair-step-wise into the hill. Because the hill was so steep, this meant that you could hardly see your neighbors on the adjoining parcels. We could see the roof of the neighbor’s house across the street from one of the front windows, but from all of the others we saw only our yard and surrounding trees. We put in loads of work on that house, replaced the siding and windows, insulated the walls and attic, lined the chimney so that we could run the woodstove safely, improved the drainage, installed wood flooring and a second woodstove in the “garage”, added lots of shelves, a portable dishwasher and a potrack to the kitchen, replaced a section of broken-up patio, and rebuilt the fence and gate. Of course, in that big yard we dug and planted garden beds and planted fruit trees and flowers. We grew out of that little 2 bed/1 bath house at the peak of the housing market and, as my husband’s group was split between there and Oregon, we decided to see if we could find a bigger house for a do-able price in that market. As hard as I tried to be fine with the suburban houses we looked at, I hated looking out my windows into my neighbors’, I hated five other yards smashed up against mine, and those were the good ones! The Urban Growth Boundary laws in the area mandated certain housing densities before they would allow building to occur outside the line. IMHO, the mandated densities verged on the abusive. We drove through one of these neighborhoods on a Saturday morning–the houses were so close together it looked like a movie set–there were kids outside trying to ride their bikes on the 15 feet of sidewalk in front of their houses, dads nearly tripping over eachother trying to wash or fix their cars. If you choose to live in the city, fine, but people typically take on the additional commute and hassle of suburban life because they want a little more space and they could not get it! I had a friend who lived in one of these neighborhoods who said she couldn’t open her windows on nice days because she could hear her neighbors arguing and smell their cigarette smoke from inside their house. Her comment, was “I thought we had left apartment life behind us.” We ended up buying an older house on 2 acres a few miles outside that line, at the end of a gravel road, surrounded on three sides by a farmer’s fields planted in blueberries and various grains. When we asked our then five-year-old Biggest Brother what was important to him in a house, he had answered “sticks!” We had plenty of those, as well as dirt to dig in, trees to climb, piles of leaves in the Fall, gorgeous sunsets, cool breezes that blew in over the fields every evening and quiet broken only by the noise of the children playing. We dug garden beds, planted fruit trees, got our first chickens and a couple of little Nigerian Dwarf goats who never made a dent in the acre-plus we had fenced. When we got ready to move here, land was the top priority. We didn’t want to build from scratch (codes and restrictions are ridiculous here) but we looked at tiny houses and the possibilities of adding on or putting up a manufactured home and keeping the first as a “granny flat”. We looked at seriously run-down houses and houses with odd room configurations and bizarre cosmetic additions, but always on land. I drooled over little nothings of places on 35 acres with riparian rights and houses where our dining table wouldn’t fit in the dining area but where you could see nearly to the State line from the front yard, but, honestly, none of these felt quite right. I found this place online one day–again at the eleventh hour. My husband liked the look of it and drove out during his lunch break and, circumstances as they were, we actually made an offer without ever have been inside the house. We came and saw it the next day. The house is enormous (built for giants, we used to say while we were trying to get used to it) and the land is great. Flat around the house, gently sloped where we are putting in the orchard, a pond, a valley that stays green when everything else has burned gold and woods in the back. And so we have begun here. A bit of garden bed digging, a couple of raised beds, a bunch of fruit trees, some grape vines and blueberry bushes started in pots in the front, a bunch of chickens, a couple each of barn cats, ducks and dairy goats and more of it to come. I love the blank canvas of land, pointing and gesturing with my husband and my kids as we stand back and plan, re-think, adjust, at times fail and then go back at it again with a new vision. There’s a great part in Laddie (Gene Stratton-Porter) when the mother and father stop the carriage at the top of a hill overlooking their property and reflect on what they dreamed it could be when they first arrived. They remember with gratitude to God all that they’ve have been able to do here and marvel at how productive and beautiful it has become. We shall see what the Lord has in store for us here. Tags: gratitude, planning, the barnyard, the house | Permalink. This is not the way you are supposed to do this. Official barn records are supposed to be a keep-as-you-go affair. Milk is supposed to be weighed and not measured by volume in order to account for foaminess. That said, I didn’t and I have no scale. I wonder somewhat whether I would have been able to hold a pen after milking Penny those first few weeks. She has really tight teat orifices and it took me close to an hour to milk her out initially…I would come back in the evening to milk and my hands would still be sore and cramped…’twas a lot of milky fun there for a while. February 16th–We sold Margo. Sigh…I really liked having a goat named Margo (this is not the right clip, but the right one is not available right now)…when we finally get a doeling we can keep, we’ll re-use that one. She had tested positive for CAE antibodies which limited her breeding options and the saleability of her babies. We thoroughly scraped out the stall, scrubbed the feeder and replaced the bedding. February 20th–We bought Penelope and Angel. Penny had kidded the day before and was FULL of milk. After the afore-mentioned hour of milking I got nearly half a gallon out of her in the morning and a little over a quart in the evening. Angel had not yet kidded. March 2nd–Angel gave birth to two bucklings (small sigh), Raphael and Gabriel. They were very cute, started nursing well, etc. Penny was up to just under a gallon a day. March 13th–Babies disbudded. Penelope was still right around a gallon. May 3rd–There is a big, flood-ish, milky wash here during which I learned to make pudding in the crock-pot, cheese and cultured buttermilk. Penelope was down closer to 3/4 of a gallon by this time. The date is significant only because I was beginning to suspect that Miss Elizabeth’s (8 yrs) “cold/allergies/irritation due to dry air” was not. May 13th–The plague had now spread to Oldest Brother, Miss Belle (5 yrs) and Miss Pleasance (2 yrs). I was up most of every night with Miss Pleasance already and as the duration of this thing is 5-10 weeks, I figured the writing was on the wall for me. No time like the present to make the switch to once a day milking, eh? My planned nice, easy transition was actually accomplished precipitously in about three days, by scootching the morning milking later and the evening earlier until they met around 5pm. The first few days she still gave me half a gallon. May 20th–She had now dropped to a quart and a half! Enough for normal use but no more cheese and only the rare custard. That was ok, we were SICK. June 16th–The family slowly began to emerge from quarantine. At some point–I honestly cannot remember when–I started to milk Angel. It was weeks and weeks after we bought her before she would even walk with me, then a good week before she would get up on the stand (with my husband hauling her up! ), then another couple of weeks before she’d let me touch her udder. Our milking routine is as follows: I give her a bucket mostly full of fine hay topped with grains for lactating goats, tie her into the stanchion, hobble (like this) her back legs, wash-spray-dry as quickly as humanly possible, clean my hands and then bump her udder like the babies do (she is not fooled, but is a little calmer than if I just go straight to milking) and then milk as gently as possible. Typically she will get tired of my messing around back there and will nose her bucket out of the stand and onto the floor. As she will not hold still at all unless she is eating, I have to put the milk someplace safe (!) get down on the floor and scoop up all the hay and grains, re-sanitize my hands and get the milk bowl down again. If I am lucky, she will let me get in a couple more squirts before she does it again. Despite having her back legs essentially tied together (too closely, I need a Goat Hobbles 2.0 before we start milking again next year) she can and does jump her hind end around when irritated. There was actually one day when she was particularly ornery, she was still closed into the stanchion and hobbled and didn’t want me to milk her any more and she pressed to a handstand on the stand! Hind legs fully up in the air, like this, except far less cute and with no voice over…although I may have heard loud, scary music as I took several steps back and considered if perhaps my goat was actually possessed. Anyhow, for all this delight I was rewarded between 1/4 and 1/2 cup of milk that could typically only be used for cooking since she kicked so much gunk around while I milked her. I would talk myself down from selling her just about every day: “this is her first freshening, first-timers don’t produce much and are twitchy, this is her training year, if she’s still rotten next year…” In the meantime, Penny’s production was continuing to decline and our hay bill was rising as the babies ate more and more. July 28th–I found out I am pregnant. Penny was down to a “fat quart”, Angel was still the same…unfortunately. Both does were looking uncomfortably skinny, while the boys had big, round bellies and were almost as big as Penny (Angel is unusually large for a Nubian). They hay bill continued to climb and we began to suspect that we had waited too long to sell these “babies”. We discussed our options: keep them entirely on pasture (would require the installation of expensive and/or labor-intensive fencing), give them to family or friends as brush control (sure would be nice to get a little money to pay for all the hay they ate! ), eat them (not sure the children would be on board with that one and I’m early pregnant–ripe for developing new and exciting food aversions), sell them. We craigslisted them for what seemed to be a fair price. No one contacted us. Gabriel. See his big belly? Poor skinny Penny is in the background. September 7th–I had been getting steadily sicker, and had shifted everything to the children except milking. The smell was getting to me, but at least it’s a sitting down chore! Penny was almost down to three cups and it hardly seemed worth it to continue. The does looked even skinnier. We decided to try selling the babies one last time before we contacted a butcher and just stored the meat until I wasn’t sick anymore. We listed them for what we figured they’d eaten plus a little and get calls right away. They are sold and gone by 4pm. Angel and the boys bleated a lot as they were being loaded, but as soon as they were in, everyone calmed down and the doting momma went back to eating. Ruminants… Evening milking went as usual. September 8th–Angel actually had milk! I thought the babies were mostly weaned, but I got nearly a quart out of her. Hooray! Why didn’t we sell them earlier? September 15th–Angel leveled off to about 3 cups and Penny went up to about five cups. Also, both of them start gaining weight. October 11th–As of yesterday Angel is producing around a pint and Penny is right around a quart. Thoughts and questions: Penny’s production seems to have dropped off kind of precipitously, but I do not know if this is due to my inability to milk her in a reasonable period of time. Until August, my hands were still getting so cramped that I had to milk her one hand at a time and I wonder if that affected her supply. Also, the quick change to once a day milking likely affected her. I’d REALLY like to have goats that I could milk through (milk more than a year without breeding) so I wouldn’t have any totally milk-less months. 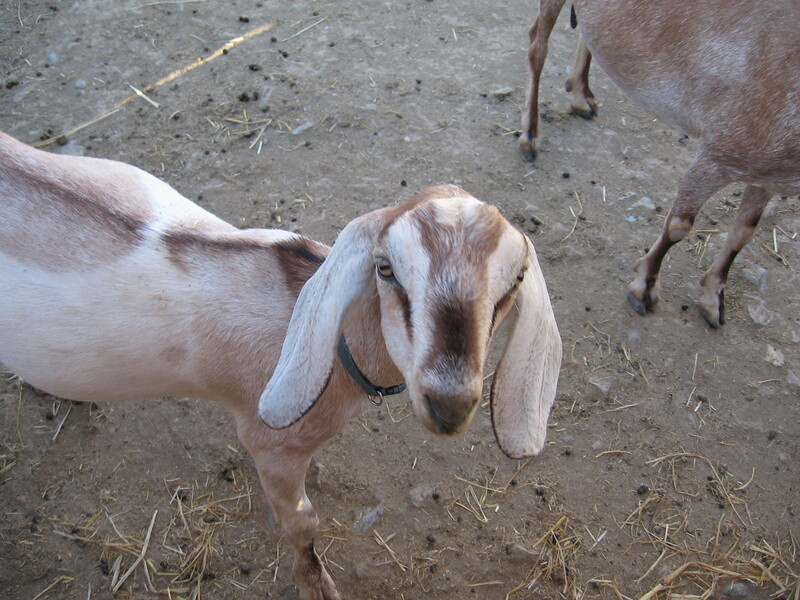 Nubians are seasonal breeders, so one can only stagger them so much. I believe that the woman we bought Penny from always dried up her does before breeding season. Do their bodies “remember” this? Also, Penny’s temperament is great, but her teat orifices are small. Orifice size is not supposed to be passed on, is temperament? Angel’s temperament is awful (IMHO), but she’s *physically* an easier milker. Who to build a flock on? I fight the wish that I were up and around and could be building goat shelters, feeders and strawberry beds; preparing garden beds and supports for grapes and berries. But the world needs this baby more than it needs all that. Before I get into the details of meat birds, I have decided to give my kids “blog names” for the sake pf privacy and security. I want them to reach their majority at least before they have to start managing an online persona… I have asked them to come up with something so I will add them in. Our first has decided he wants to be “Oldest Brother”. We will see how long they like their names! All right, that’s enough to get started on this post. Oldest Brother (who is nearly fourteen, nearly as tall as I am and would weigh the same IF I were not currently pregnant), apparently, needs a project. Every week or so he comes up to me and says, Momma, I think I’d like to raise a flock/herd of (something). I want to encourage all the kids to do things like this. We’ve talked about, rather than giving them money for college/missions/starting out getting them started on enterprises such as these where they can work to earn their own. Money one earns oneself is rarely wasted, especially at these ages when it is earned with such great difficulty. I well remember the hundreds of hours of babysitting I did in my teens at a dollar an hour… It seems that this early understanding of the value of a dollar is a good legacy to leave them with. Anyhow, I digress. Until this week, I could not meet his ideas with unqualified enthusiasm. The land is plentiful and has a great deal of potential but it is BARE. All animal shelters, gardens, orchards, etc must be built, dug and planted by us as time, energy and finances allow. We do have a single fenced pasture on the North side of the property, but it is now seriously overgrazed (after having two rather piggish little wethers, their mom and aunt on it during the dry and barren summer months) and not providing much besides space for our two milk does to walk around during the half of the day they are out there. In it’s current state it can hardly be counted as much of an asset and it is certainly insufficient to support additional animals. Thus his idea of raising a herd of meat goats was not met the way he had likely hoped. Goats require fences to prevent the premature strangling of said animals as they can be rather destructive when untrammeled. 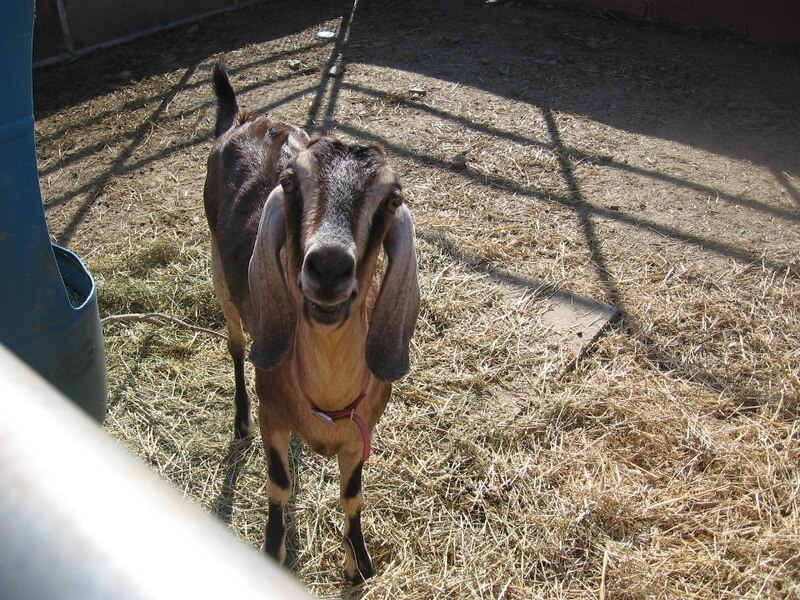 Goats also require a fair amount of maintenance, from hoof-trimming, to breeding and kidding, disbudding, castration and de-worming and the loss of an animal represents at least $100 worth of purchase price plus all the above inputs. It didn’t seem like the best place to start. This week his proposal was meat birds and it was immediately followed by the revelation of a salmonella outbreak at the processing plant where we bought our chicken this weekend. His timing couldn’t have been better… We had a friend who worked in the meat section of a grocery store who told us that some degree of salmonella contamination is near-universal in store-bought chicken, so I realize that this is nothing new and we are always very careful in our cooking and handling of meat, but, boy, it sure would be nice not to be bringing that stuff into my kitchen at all. And so, Oldest Brother is putting together a (hopefully!) comprehensive proposal on raising a flock of meat birds for the family. We will provide the chicks, feed and materials, and he, the labor. If he gets to the point that he feels he can make it financially profitable, we’ll likely re-work the details to make it more completely his. Currently, I think he’s inclined toward Freedom Rangers and he is trying to hash out chicken tractors vs. moveable poultry fencing. He’s gathered up all the chicken books we own and is currently reading “Pastured Poultry Profits”. I’m trying really hard not to give too much advice or overwhelm him with suggestions. I love researching new projects, so I have to keep reminding myself that this is his baby. I can’t wait to see what he comes up with! Tags: chickens, planning, the barnyard | Permalink.